Yesterday I finished up a pouffe for a client – if you follow me on Instagram you’ve already seen a peek at the pouffe! After I finished the pouffe I wanted to take some fun pics of it so I could share it here on the blog. And one thing always leads to another – I decided to change up the vignette in my dining room nook. 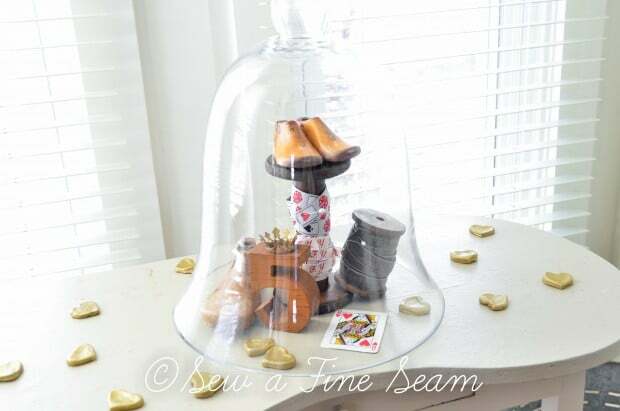 So today I’m sharing the pics of my valentine’s vignette with you. 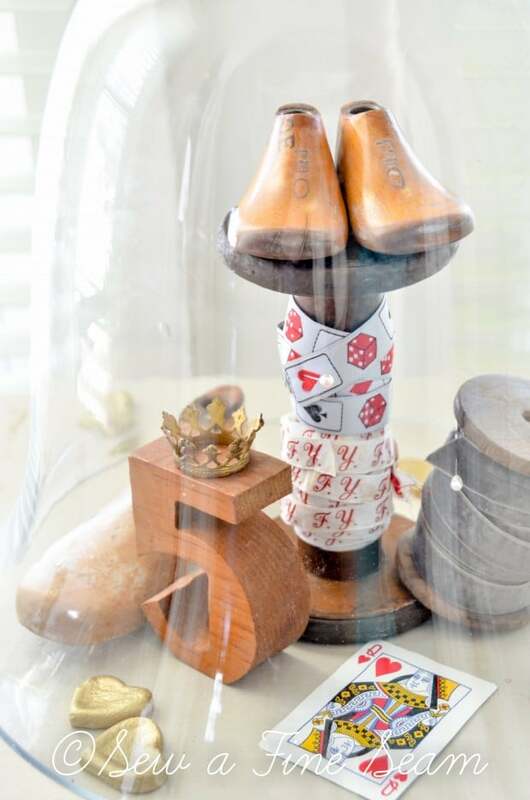 I wrapped a couple of my favorite ribbons around an old wooden spool, added a spool of grey velvet ribbon, a wooden number 5 and some vintage shoe lasts. 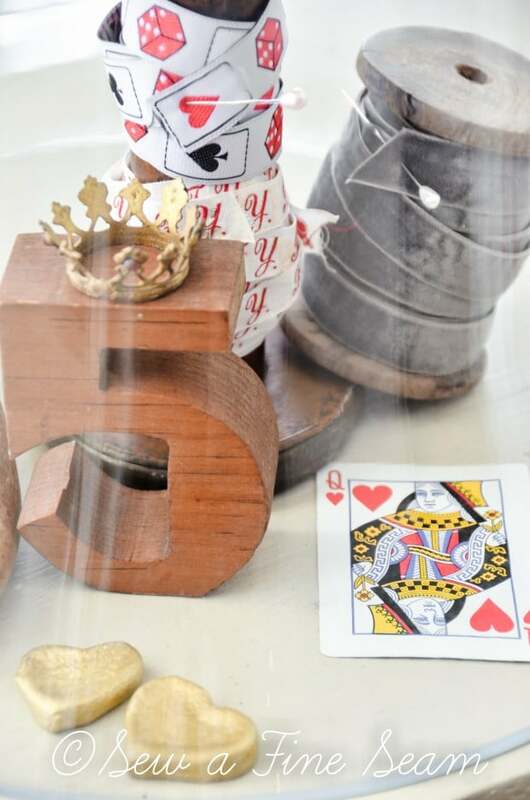 I scattered my gold painted, salt dough hearts around and tucked a Queen of Hearts card in just for Valentine’s day. 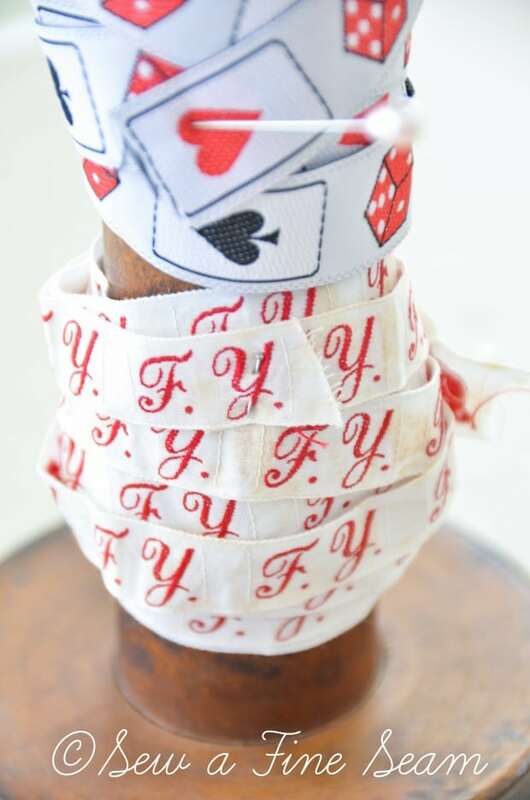 The initial ribbon is vintage French ribbon. Do you see that tiny pin in it? 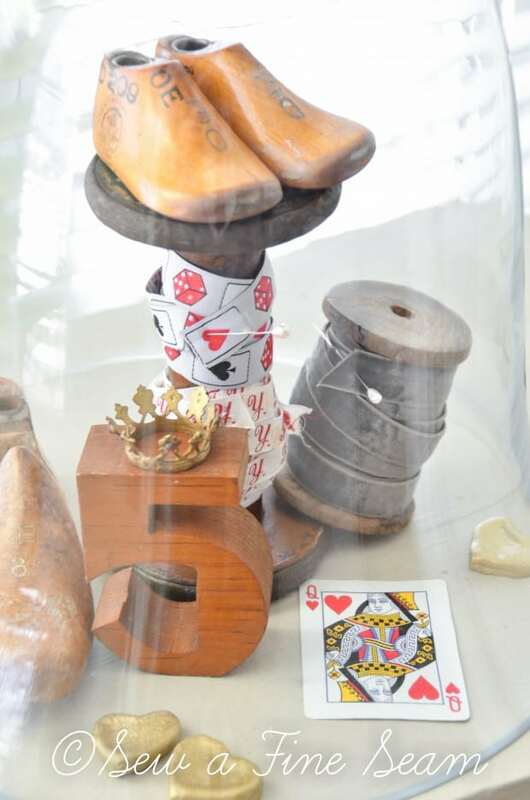 That pin came with the ribbon and looks to be original – it is connecting two pieces of ribbon together to get the proper length for the box of ribbon! I love this detail! I love this tiny crown – I found it at a local shop before Christmas and since my Mom was with me she got it for me and gave it to me for Christmas. I’d like to have a few more like it to use on table settings or as napkin rings. What do you have planned for Valentine’s?! Do you celebrate? Come back tomorrow – I’ve got a sweet little love story for you! Thanks Pam! It’s always fun to use stuff that are my favs! Your Valentines Day decorations are cute! I suspect we will postpone our Valentines celebration because we’ve been housebound due to the snow storm going on here. I haven’t had a chance to prepare for it. Thanks Kelly. And I hope your electric has stayed on and you can at least snuggle in and be warm in your house this Valentines day! It’s snowing heavy here now and the roads look treacherous! Oh how I love your display. Well I am going shopping with my daughter tonight so she can shop for her boyfriend, and I am going to finish shopping for my granddaughter. Last night after a year I finally order prints blown up in blk/white of my vacation last year and some family shots. That’s my gift to me! Can’t wait to pick them up today. Have a great day! So cute! I don’t decorate for valentines but you have inspired me to do some decorating ! Thanks Anita! I hope your Valentines Day is going wonderful! Pure bliss, Jill! You have such an artistic eye! 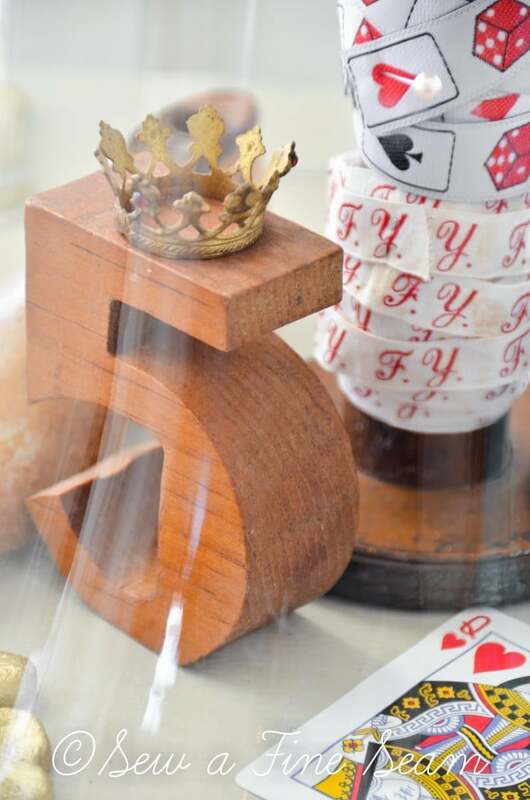 I love the little crown – do you know much about it? I think it might be a Madonna statue crown. So lovely. 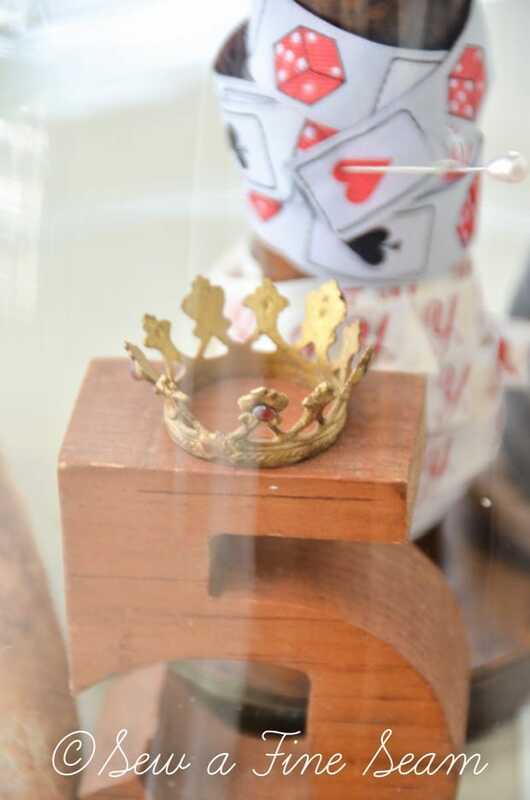 Thanks Loi – I really don’t know anything about the crown – I got at a home decor boutique. I was assuming it is a reproduction of something old? I know she had more than one to start with but this was the only one she had left. You have such a beautiful collection of crowns. I love your newest mini crown. And, as always your decorations are the perfect amount, organized in just the right way. Love. Thanks Amy! Your are so sweet and I’m so thankful you are my friend! The little gold saltdough hearts are such a fun, whimsical touch!